Vox V-232 Violin Bass Model Solid Body Electric Bass Guitar (1965), made in Recanati, Italy, serial # 231503, sunburst polyester finish, laminated hardwood body, laminated maple neck with ebony fingerboard, original grey hard shell case. One of the rarest of the earliest Eko-made Vox line, this Hofner-inspired bass is quite unlike most contemporaries and is actually a solid (or mostly solid) body instrument. With two Vox pickups, no pickguard, and a simple 3-knob switching system, it is cleaner looking than most similar period basses. It is also more useful than many, as it is less prone to feedback than the typical 1960s hollow body bass. By mid-1966 Vox/Eko joined the crowd and switched to a more typical hollow body violin bass, so this particular instrument was only offered for about a year. 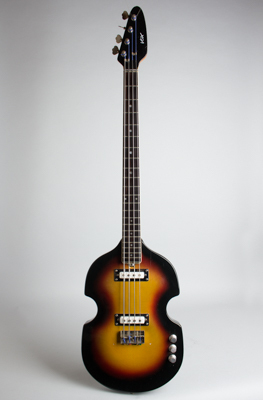 A solid player and a neat find in a mid-'60s bass with more individual character than most Beatle-inspired 4-strings. Overall length is 45 in. (114.3 cm. ), 11 1/2 in. (29.2 cm.) wide at lower bout, and 1 3/4 in. (4.4 cm.) in depth, measured at side of rim. Scale length is 30 in. (762 mm.). Width of nut is 1 5/8 in. (41 mm.). A nice bass overall; there is some typical Eko-Vox finish checking, but no major wear. There is one fairly big chip on the lower headstock face by the edge that has been filled in, and another chip on the top edge. The body shows some long checks and one chip of finish missing just under the truss rod adjustor. Other than these spots there is not much wear on this bass. The neck is in good shape with some finish checks but none of the typical Eko-made-Vox fingerboard crack or lamination issues. Missing the chrome bridge cover but everything else is intact. This is a nice example of this slightly oddball Vox bass; very comfortable to play with a good versatile sound. Includes the original grey teardrop-shaped Vox HSC. Excellent - Condition.